The Chinese year of the tiger (solar year) begins February 4, however, the official Chinese 2010 New Year (lunar calendar) is celebrated on February 14. 2010 will be a metal year. To understand the significance of this element it's best to examine the attributes assigned to the metal tiger. 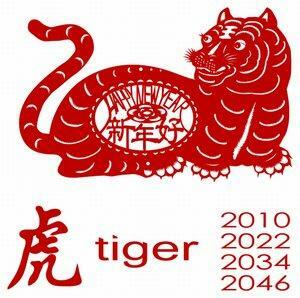 To arrive at predictions for what 2010 will bring into the world and into your life, you must first understand what the tiger symbol means in Chinese horoscopes. The tiger is a powerhouse of energy that can spring into action at a moment's notice and always land on its feet. A resourceful animal, the tiger never goes without. When faced with a problem, this feline doesn't wait for someone to help him or get upset over the issue. Action is the tiger's response mechanism and it's more than just a reaction. Tigers are very proactive and take control of situations. 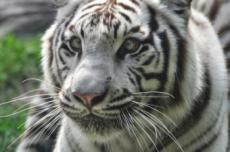 The tiger can also be gentle, fun-loving and affectionate. As a parent, the tiger is very nurturing and loving. In China, the tiger is a symbol of luck and power. You'll find tiger symbols throughout homes in China. People who are born in a tiger year are thought to become prosperous by virtue of the sign. That's not to say that tiger people are focused on making money. The focus of a tiger person is having luxury and living well. Money is simply the necessary means of having these things. A tiger person has a unique ability to simply earn money whenever it's needed. The ease of this ability is why the tiger is considered such a lucky symbol. Many would call this ability the Midas Touch where everything the tiger touches turns to gold. A tiger commands respect simply by the majestic way he carries himself and exudes authority by his demeanor. Competition is something the tiger craves and enjoys. It's the tiger that sees an injustice and rushes in to correct it. The tiger will risk life and limb to protect or save another. The tiger has such a big heart that personal safety is often foolishly risked. The tiger has no fear. Tiger people crave adventure and are sometimes viewed as daredevils. The tiger moves through life not from the seat of his or her mind, but from the heart. The tiger operates on raw emotions, not mental contemplation. This can sometimes lend this bold creature into unpleasant situations where a bit of forethought could have averted conflict or even loss. The tiger has great strength with the amazing ability to endure great stress and arduous tasks. This powerhouse of energy needs a way to expel this excess buildup of energy. Now that you understand the traits of the tiger and its most compatible signs, a picture of what's in store for the year 2010 begins to form. You can expect 2010 to be the year of work. The tiger plows through all of the dense jungle undergrowth in a determined path, always moving confidently and quickly toward the goal. You'll need to take on the tiger's agility to react and take decisive action when faced with obstacles, cutbacks and possible hardships. The tiger is resilient and able to reinvent itself. So can you. Remember, the tiger knows how to make money, so be sure to take advantage of it. The tiger loves competitions and this could be a beneficial energy for a poor economy. The tiger is an affectionate and caring parent. The emphasis on family and family values will be one of the 2010 themes. You'll be assessing and reassessing your family situation for good or bad. Things you may have dismissed or even thought were unimportant to your family will become the centerpiece of your year. Creating a nurturing and loving home for your family will be a major desire this year. Many people will buy a new home or remodel an existing home. Comfort in your home will be a prime objective. Another aspect of the tiger year is learning to trust your instincts. In a modern world, this ability has been replaced with consumer watch groups, scientific research and evidence and a wide range of other accepted authoritative filtering systems. You may be like the majority of the people and rely on these authoritative resources to guide your decisions. While this isn't necessarily bad, this reliance on outside influences to determine what is good or bad has weakened and dulled the natural ability to instinctively sense what is good or bad. You can take advantage of the tiger's instincts and hone yours this year. Since the tiger is ruled by emotions first, 2010 will be a year of delving into emotions. For those who are uncomfortable with emotions, 2010 will be difficult and uncomfortable because the heart will not be denied a voice. It's best to just push through the emotional sea like the tiger runs through the jungle. With so much energy being ushered into the emotional nature of life, excess will become an issue for many in 2010. It's good to keep this in mind when indulging. Moderation is the best path to take this upcoming year. Since the tiger lives on raw emotions and instincts, there will be moments of an extreme lack of rational thought throughout 2010. Those who are normally emotional beings will be challenged. Wars can easily erupt under these conditions, both personally and globally. The Chinese year of the tiger can be beneficial to you if you focus on tiger traits when working through the year's challenges.